(Nanowerk News) A research team led by Dominik Schneble, PhD, Associate Professor in the Department of Physics and Astronomy in the College of Arts and Sciences at Stony Brook University, has developed a novel method to explore spontaneous emission – when an atom or molecule transitions from an excited energy state to a lower energy state. Using a principle called wave-particle duality, the team constructed artificial emitters that spontaneously decay by emitting single atoms, rather than single photons. This method, published in Nature ("Spontaneous emission of matter waves from a tunable open quantum system"), uses ultracold matter waves and provides a novel experimental platform that may help scientists advance their understanding of open quantum systems and their applications. 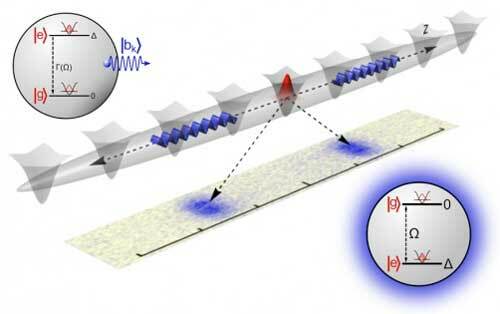 The research is also featured in a Nature article titled Quantum optics without photons . Spontaneous emission in quantum physics refers to the mechanism by which an excited atom loses energy by emitting a photon, that is, a quantum of radiation. The phenomenon is responsible for most of what we see around us, from the light of distant stars to the glow of a fire. It was long believed that spontaneous emission, driven by vacuum fluctuations, is inherently irreversible. The research team devised experimentation in order to address some fundamental questions: Exactly what role does the vacuum play in spontaneous emission? How do elementary, reversible quantum processes give rise to the observed irreversibility? Are there other possibilities than the photon escaping into the vacuum? To address these questions and attempt to answer them, the researchers needed to construct a way to control the emitter and the emission process. The researchers turned to wave-particle duality in quantum mechanics: light and matter both can behave as particles and waves, so one can replace the photon with another quantum particle, if only a suitable emitter for such a particle can be constructed. “Using an optical lattice, we built an array of microscopic atom traps that are driven by tunable microwave radiation and emit ultracold matter waves at millimeter-per-second speeds,” explained Schneble. Their method enabled the researchers to directly observe spontaneous-emission behavior that is fundamentally different from the usually expected exponential decay. This included both partial backflow of radiation into the emitter, and the formation of an exotic bound state in which particles escape from the emitter but then hover around it in a virtual excitation state. Their discovery may prove to be a foundational way to create alternatives to photonic quantum systems, leading to new models and applications in emergent quantum technologies of the 21st Century.